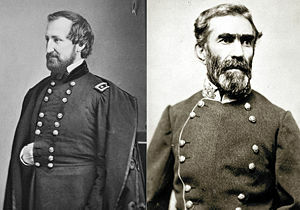 corps, Brig.-Gen. Robert B. Mitchell, embraced the divisions of Col.
erals on the left and rear. series of unforeseen occurrences prevented its successful execution. cavalry that it was 3 p. m. before he gained possession of the bridge. enemy's position. Finding Walker about to cross at Alexander's bridge. Walker to cross at Byram's ford several hours behind schedule time. menace Wilder's flank, and the latter retired toward Gordon's miills. mauga, and again his plans had failed. to the Federal rear. The battle was opened on the 19th by Thomas. erable loss to the assailants. This ended the fighting for the day. 11 p. m. on the 19th and assumed command of the left wing. left until the road to Chattanooga was in possession of the Confederates. dawned red and sultry, with a dense fog hanging over the battle-field. division to the front to fill the gap in the line caused by Negley's removal. after it was in position on the left, and it was driven back in confusion. of the enemy and finally drove him entirely from Baird's flank and rear. vanced, striking Johnson, Palmer and Reynolds in quick succession. made a desperate effort to drive in the center and turn Thomas' right. less fire and each time they were repulsed with fearful slaughter. Walworth and Lytle to change front and assist in repelling the assault. to withdraw to the Dry Valley road in order to save his command. on the right, concentrated their whole efforts to destroy them." right angles to the one on which Brannan and Wood were posted. which was held by Steedman until 6 p. m., when he fell back under orders. when Gen. Garfield, Rosecrans' chief of staff, arrived from Rossville. Confederate losses, as given in "Battles and Leaders of the Civil War,"
amounted to 2,389 killed, 13,412 wounded, and 2,003 missing.